The Alabama Crimson Tide football program represents the University of Alabama (variously Alabama, UA, or Bama) in the sport of American football. The team competes in the Football Bowl Subdivision (FBS) of the National Collegiate Athletic Association (NCAA) and the Western Division of the Southeastern Conference (SEC). The team is currently coached by Nick Saban. The Crimson Tide is among the most storied and decorated football programs in NCAA history. Since beginning play in 1892, the program claims 17 national championships, including 12 wire-service (AP or Coaches) national titles in the poll-era, and five other titles before the poll-era. From 1958 to 1982, the team was led by Hall of Fame coach Paul "Bear" Bryant, who won six national championships with the program. Despite numerous national and conference championships, it was not until 2009 that an Alabama player received a Heisman Trophy, when running back Mark Ingram became the university's first winner. In 2015, Derrick Henry became the university's second Heisman winner. Alabama has 905 official victories[a][b] in NCAA Division I (an additional 21 victories were vacated and 8 victories and 1 tie were forfeited), has won 31 conference championships (4 Southern Conference and 27 SEC championships) and has made an NCAA-record 69 postseason bowl appearances. Other NCAA records include 23 winning streaks of 10 games or more and 19 seasons with a 10–0 start. The program has 34 seasons with 10 wins or more (plus one vacated), and has 41[b] bowl victories, both NCAA records. Alabama has completed 10 undefeated seasons, 9 of which were perfect seasons. The Crimson Tide leads the SEC West Division with 14 division titles and 12 appearances in the SEC Championship Game. Alabama holds a winning record against every current and former SEC school. The Associated Press (AP) ranks Alabama 4th in all-time final AP Poll appearances, with 53 through the 2015 season. Alabama plays its home games at Bryant–Denny Stadium, located on the campus in Tuscaloosa, Alabama. With a capacity of 101,821, Bryant-Denny is the 8th largest non-racing stadium in the world and the seventh largest stadium in the United States. Alabama has had 28 head coaches since organized football began in 1892. Adopting the nickname "Crimson Tide" after the 1907 season, the team has played more than 1,100 games in their 114 seasons. In that time, 12 coaches have led the Crimson Tide in postseason bowl games: Wallace Wade, Frank Thomas, Harold D. "Red" Drew, Bear Bryant, Ray Perkins, Bill Curry, Gene Stallings, Mike DuBose, Dennis Franchione, Mike Shula, Joe Kines, and Nick Saban. Eight of those coaches also won conference championships: Wade, Thomas, Drew, Bryant, Curry, Stallings, DuBose, and Saban. During their tenures, Wade, Thomas, Bryant, Stallings, and Saban all won national championships with the Crimson Tide. Of the 27 different head coaches who have led the Crimson Tide, Wade, Thomas, Bryant, and Stallings have been inducted into the College Football Hall of Fame. The current head coach is Nick Saban, who was hired in January 2007. National championships in NCAA FBS college football are debated as the NCAA does not officially award the championship. Despite not naming an official National Champion, the NCAA provides lists of championships awarded by organizations it recognizes. According to the official NCAA 2009 Division I Football Records Book, "During the last 138 years, there have been more than 30 selectors of national champions using polls, historical research and mathematical rating systems. Beginning in 1936, the Associated Press began the best-known and most widely circulated poll of sportswriters and broadcasters. Before 1936, national champions were determined by historical research and retroactive ratings and polls. [...] The criteria for being included in this historical list of poll selectors is that the poll be national in scope, either through distribution in newspaper, television, radio and/or computer online." Since World War II, Alabama only claims national championships awarded by the final AP Poll or the final Coaches' Poll. This policy is consistent with other FBS football programs with numerous national title claims, including Notre Dame, USC, and Oklahoma. All national championships claimed by the University of Alabama were published in nationally syndicated newspapers and magazines, and each of the national championship selectors, and are cited in the Official 2010 NCAA FBS Record Book. In addition to the championships claimed by the university, the NCAA has listed Alabama as receiving a championship for the 1945, 1966, 1975, and 1977 college football seasons. In Alabama's 1982 media guide, the last for Coach Bryant, 1934 is listed as the only national championship before Coach Bryant in a footnote about the school's SEC history. In the 1980s, Alabama's Sports Information Director Wayne Atcheson started recognizing five pre-Bryant national championship teams (1925, 1926, 1930, 1934, 1941) by adding them to the University's Football Media Guide. According to Atcheson, he made the effort in the context of disputed titles being claimed by other schools, and "to make Alabama football look the best it could look" to compete with the other claimants. Atcheson maintains that the titles are the school's rightful claims. The University of Alabama 2009 Official Football Media Guide states that Alabama had 12 national championships prior to winning the 2010 BCS National Championship Game. The 2009, 2011, 2012, 2015, and 2017 titles bring the total number of national championships claimed by Alabama to 17. Twelve of Alabama's national championships were awarded by the wire-services (AP, Coaches' Poll) or by winning the BCS National Championship Game. In January 2013, CNN suggested that Alabama might be college football's new dynasty, and in May 2013, Athlon Sports ranked Alabama's ongoing dynasty as the fourth-best since 1934, behind Oklahoma (1948–58), Miami (1986–92), and Nebraska (1993–97). 1925 – The 1925 Alabama Crimson Tide football team, coached by Wallace Wade, completed the regular season 9–0–0, winning the Southern Conference championship. Alabama was then invited to play Washington in the January 1, 1926 Rose Bowl. Coach Wade's team initially fell behind the undefeated Huskies, but rallied in the second half to defeat Washington 20–19. The outstanding player of the game was Johnny Mack Brown. This game is viewed by many football historians as the single most important event for Southern football, and is hailed "the football game that changed the South." Alabama was the first Southern football team to be invited to play in the Rose Bowl, and proved that the Southern teams could compete with those from the East, the Midwest and the West coast. The victory for Coach Wallace Wade established Alabama as a football powerhouse. The 1925 Alabama football team finished the season with a 10–0–0 record and was selected national champion by the Football Annual, Billingsley, and the Helms Athletic Foundation. 1926 – The 1926 Alabama Crimson Tide football team, coached by Wallace Wade, completed the regular season 9–0–0, winning the Southern Conference championship. Alabama was then invited to play Stanford in the January 1, 1927 Rose Bowl. Coach Wade's team tied the Indians 7–7 to finish the season 9–0–1. The outstanding player of the game was Fred Pickhard. The 1926 Alabama football team was selected national champion by Billingsley and the Helms Athletic Foundation. 1930 – The 1930 Alabama Crimson Tide football team, coached by Wallace Wade, completed the regular season 9–0–0, winning the Southern Conference championship. Alabama was then invited to play Washington State in the January 1, 1931 Rose Bowl. Coach Wade's team defeated the Cougars 24–0 to finish the season 10–0–0. The outstanding player of the game was John Campbell. The 1930 Alabama football team tied with Notre Dame as national champions in the Davis Poll. 1934 – The 1934 Alabama Crimson Tide football team, coached by Frank Thomas, completed the regular season 9–0–0, winning the Southeastern Conference championship. Alabama was then invited to play Stanford in the January 1, 1935 Rose Bowl. Coach Thomas' team defeated the Indians 29–13 to finish the season 10–0–0. The outstanding player of the game was Millard "Dixie" Howell. The 1934 Alabama football team was selected national champion by Dunkel, Williamson, and Football Thesaurus. The University of Alabama honored Ben McLeod, Jr., the 95-year–old former backup End of the 1934 team at the September 6, 2008 Alabama–Tulane game. 1941 – The 1941 Alabama Crimson Tide football team, coached by Frank Thomas, completed the regular season 8–2–0. Alabama's squad finished 3rd in the Southeastern Conference. After losing to Mississippi State 14-0 and Vanderbilt, 7–0, Alabama finished the regular season ranked No. 20 in the AP Poll, which was the finalized with two games left in the regular season. The onset of World War II changed the college football postseason. Alabama was one of 10 teams chosen for post-season competition when they were invited to play Texas A&M in the January 1, 1942 Cotton Bowl Classic. Coach Thomas' team defeated the Aggies 29–21 to finish the season 9–2–0. Minnesota, the AP national champion, finished 8–0 and did not play in a bowl game per Big 10 rules. Alabama's outstanding players of the game were Holt Rast, Don Whitmire, and Jimmy Nelson. The squad was selected national champions by the Houlgate Poll, published in the nationally syndicated Football Thesaurus. The 2009 NCAA Record Book cites the Minnesota Golden Gophers, the Texas Longhorns, and the Alabama Crimson Tide as the three teams selected as national champions in 1941. The Tuscaloosa News described the 1941 Alabama Crimson Tide as the university's best team since the 1934 Rose Bowl Championship Team. The September 11, 1967 issue of Sports Illustrated lists Alabama's 1941 squad as national champion based on Alabama's strength of schedule relative to Minnesota's and because of the early final AP Poll. 1961 – The 1961 Alabama Crimson Tide football team, coached by Bear Bryant, completed the regular season 10–0–0, winning the Southeastern Conference championship. Led by quarterback Pat Trammell, linebacker Lee Roy Jordan and two–way lineman Billy Neighbors, Alabama outscored their opponents 297–25. Alabama was then invited to play the #9–ranked Arkansas Razorbacks in the January 1, 1962 Sugar Bowl. Coach Bryant's team defeated the Razorbacks 10–3 to finish the season 11–0–0. The outstanding player of the game was Mike Fracchia. The 1961 Alabama football team was selected national champion by the AP Poll and Coaches' Poll. 1964 – The 1964 Alabama Crimson Tide football team, coached by Bear Bryant, completed the regular season 10–0–0, winning the Southeastern Conference championship. Alabama was led by quarterback Joe Namath. Alabama was then invited to play the Texas Longhorns in the January 1, 1965 Orange Bowl. Coach Bryant's team lost to the Longhorns 21–17 to finish the season 10–1–0. The outstanding player of the game was Joe Namath. The 1964 Alabama football team was selected national champion by the AP Poll and the Coaches' Poll prior to bowl games. The AP Poll waited until after the bowl games to select their champion for the 1965 season. 1965 – The 1965 Alabama Crimson Tide football team, coached by Bear Bryant, completed the regular season 8–1–1, winning the Southeastern Conference championship. The Tide lost to Georgia and tied Tennessee during the regular season. Alabama was then invited to play Nebraska in the January 1, 1966 Orange Bowl. Coach Bryant's team defeated the Cornhuskers 39–28 to finish the season 9–1–1. The outstanding player of the game was Steve Sloan. The 1965 Alabama football team was selected national champion by the AP Poll. 1973 – The 1973 Alabama Crimson Tide football team, coached by Bear Bryant, completed the regular season 11–0–0, winning the Southeastern Conference championship. Alabama was then invited to play Notre Dame in the December 31, 1973 Sugar Bowl. Coach Bryant's team lost to the Fighting Irish 24–23 to finish the season 11–1–0. The 1973 Alabama football team was selected national champion in the final regular season Coaches' Poll, which was finalized prior to the post-season bowl games. The Coaches' Poll began selecting their champion after the bowl games starting in 1974. The post-bowl game AP Poll ranked Alabama 4th, and selected Notre Dame as its national champion. 1978 – The 1978 Alabama Crimson Tide football team, coached by Bear Bryant, completed the regular season 10–1–0, winning the Southeastern Conference championship. The Tide defeated #10–ranked Nebraska 20–3, and defeated #11–ranked Missouri 38–20, and lost to #7-ranked Southern California 24–14, during the regular season. The #2-ranked Alabama Crimson Tide was then invited to play the #1–ranked Penn State in the January 1, 1979 Sugar Bowl. Coach Bryant's team defeated the Nittany Lions 14–7 to finish the season 11–1–0. The outstanding player of the game was linebacker Barry Krauss. Alabama was selected national champion by the AP Poll, and Southern California was selected national champion by the Coaches' Poll. 1979 – The 1979 Alabama Crimson Tide football team, coached by Bear Bryant, completed the regular season 11–0–0, winning the Southeastern Conference championship. The Tide defeated #18–ranked Tennessee 27–17, and defeated #14–ranked Auburn 25–18 during the regular season. Alabama was then invited to play #6–ranked Arkansas in the January 1, 1980 Sugar Bowl. Coach Bryant's team defeated the Razorbacks 24–9 to finish the season 12–0–0. The outstanding player of the game was running back Major Ogilvie. The 1979 Alabama football team was selected national champion by the AP Poll and the Coaches' Poll. 1992 – The 1992 Alabama Crimson Tide football team, coached by Gene Stallings, completed the regular season 11–0–0. They then defeated #12–ranked Florida in the inaugural SEC Championship Game, defeating the Gators 28–21; the win gave Alabama its 20th SEC title and a record of 12–0–0. Alabama was then invited to play #1–ranked Miami, led by Heisman trophy winner Gino Torretta, in the January 1, 1993 Sugar Bowl. Coach Stallings' team defeated the Hurricanes 34–13 to finish the season 13–0–0. The outstanding player of the game was Derrick Lassic. The 1992 Alabama football team was awarded the national championship by the AP Poll and the Coaches' Poll. 2009 – The 2009 Alabama Crimson Tide football team, coached by Nick Saban, finished with a 12–0 regular season. In the 12 wins, the Crimson Tide defeated four teams that were ranked at the time, including an opening day victory over No. 7 Virginia Tech in the Chick-fil-A Kickoff Game. The team headed back to the Georgia Dome in December to face off against #1 Florida in the SEC Championship Game. The Crimson Tide defeated the Gators 32–13 in a rematch of the previous year's championship. Alabama then traveled to Pasadena to face #2-ranked Texas in the 2010 BCS National Championship Game at the Rose Bowl. Alabama's Heisman Trophy-winning running back, Mark Ingram, rushed for 116 yards and two touchdowns in a 37–21 win. This was Alabama's first victory over Texas (1–7–1). Ingram was named the game's offensive MVP in Alabama's first BCS victory. The 2009 Alabama football team was selected national champion by the AP and Coaches' Polls. The 2009 squad became the first FBS division team to defeat six teams ranked in the AP top 25 during one season and received a record six first team AP All-America selections. The 2009 team finished with a perfect 14–0 record, an all-time highest number of wins in a season for Alabama. 2011 – The 2011 Alabama Crimson Tide football team, coached by Nick Saban, completed the regular season 11–1. The only loss of the season was to LSU in overtime 9–6. The team did not play in the SEC Championship Game because of that loss, but won convincingly in its final three regular-season games and earned a No. 2 ranking in the BCS poll. For their final regular season game, Alabama defeated rival Auburn 42-14. Alabama, led by Heisman trophy finalist Trent Richardson, then qualified to play No. 1 ranked LSU in the 2012 BCS National Championship Game. Coach Saban's team defeated the Tigers 21–0 and finished the season 12–1. Jeremy Shelley had a bowl record-tying five field goals in the game, and the game's offensive MVP was AJ McCarron, and the defensive MVP was Courtney Upshaw. With the win, Alabama became the first team to shutout its opponent in a BCS bowl game. In addition to winning the BCS National Championship, the AP also awarded its national title to Alabama for the 8th time. 2012 – The 2012 Alabama Crimson Tide football team, coached by Nick Saban, completed the regular season 11–1. The only loss of the season was against Texas A&M 29–24. Despite the loss, Alabama won the SEC Western division and went to the 2012 SEC Championship Game, where they defeated Georgia 32–28 for the 23rd conference championship in school history. Alabama earned a No. 2 ranking in the final BCS rankings for the second straight year and as a result qualified for the 2013 BCS National Championship Game against No. 1 Notre Dame. Alabama defeated the Fighting Irish 42–14, finished the season 13–1, and the game's offensive MVP was Eddie Lacy, and the defensive MVP was C.J. Mosley. Alabama became the third team in history to win three national championships in a four-year period. This was Alabama's 9th AP national championship and 10th wire-service championship. 2015 – The 2015 Alabama Crimson Tide football team, coached by Nick Saban, finished the regular season 11–1. Their only loss was to Ole Miss 43–37. They won the SEC Western Division title with a record of 7–1, defeating rivals LSU and Tennessee en route, and then defeated Florida 29–15 in the SEC Championship. Alabama returned to the playoffs for the second consecutive season. After falling short in the semifinals against Ohio State in 2014, Alabama defeated the Michigan State Spartans 38–0 in the Cotton Bowl to advance to the Championship Game. Alabama beat the Clemson Tigers 45–40 and won the 2015 FBS national championship. Alabama's Heisman Trophy-winning running back Derrick Henry rushed for 158 yards and 3 touchdowns. This victory gave Coach Nick Saban his fifth national title, including four in the last seven seasons. 2017 - The 2017 Alabama Crimson Tide football team, coached by Nick Saban, finished the regular season 11-1. Their only loss was at Auburn 26-14. They won a share of the SEC Western Division title with a record of 7-1. Alabama returned to the playoffs for the fourth consecutive season. Alabama avenged the previous season's only loss in the National Championship game to Clemson with a 24-6 win in the Sugar Bowl. The Tide advanced to the Championship game for the third year in a row. Alabama defeated SEC opponent Georgia 26-23 in overtime. The victory gave Nick Saban his sixth national title, tying him with Paul W. Bryant for most all time. It's also Alabama's fifth title in the last nine seasons. Alabama has won a total of 31 conference championships; this includes 4 Southern Conference and 27 SEC Championships. Alabama captured its 4 Southern Conference titles in 1924, 1925, 1926, and 1930. Alabama captured the first SEC title in 1933 and has won a total of 26 SEC Championships (1933, 1934, 1937, 1945, 1953, 1961, 1964, 1965, 1966, 1971, 1972, 1973, 1974, 1975, 1977, 1978, 1979, 1981, 1989, 1992, 1999, 2009, 2012, 2014, 2015, 2016, 2018). The school has won more SEC football titles than any other school, including seven since the conference split into separate divisions and added the Championship Game in 1992. Alabama is the only SEC school to win an SEC Championship in every decade since the conference was founded in 1933. The SEC has been split into two divisions since the 1992 season. Alabama competes in the SEC West. Alabama has won or shared 14 division titles, and has posted a 8–4 record in the SEC Championship Game as of 2018[update]. 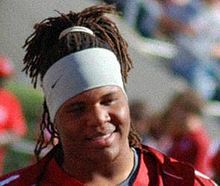 Terrence Cody was named an All-American for both 2008 and 2009 seasons. Every year, several publications release lists of their ideal "team". The athletes on these lists are referred to as All-Americans. The NCAA recognizes five All-American lists. They are the Associated Press (AP), American Football Coaches Association (AFCA), Football Writers Association of America (FWAA), Sporting News (TSN), and the Walter Camp Football Foundation (WCFF). Alabama has had 131 players honored 153 times as first team All-Americans (74 consensus) in its history, including 18 players honored twice and two players (Cornelius Bennett and Woodrow Lowe) who were honored three times as a First Team All-American. The most recent All-Americans from Alabama came after the 2018 season, when Tua Tagovailoa, Jerry Jeudy, Jonah Williams, Ross Pierschbacher, Quinnen Williams and Deionte Thompson were each named First Team All-America by various selectors. In 1951, the College Football Hall of Fame opened in South Bend, Indiana. Since then, Alabama has had 20 players and 4 former coaches inducted into the Hall of Fame. Alabama had two members inducted into the inaugural 1951 class—Don Hutson and Frank Thomas. On December 12, 2009, Mark Ingram became Alabama's first Heisman Trophy winner. In the closest race ever, he edged out Stanford running back Toby Gerhart by 28 points. Other notable finishes for an Alabama player occurred in 1993, when David Palmer finished 3rd in the Heisman voting and when AJ McCarron finished as runner-up for the 2013 season. Derrick Henry became Alabama's second Heisman trophy winner on December 12, 2015. Starting in 1994, the Southeastern Conference has annually honored one former football player from each of the SEC member schools as an "SEC Legend". The following former Crimson Tide football players have been honored as SEC Legends. The main rivalry of the Crimson Tide is against its in-state rival, Auburn University; considered one of the top rivalries in all of sports. The Alabama-Auburn game has come to be known as the Iron Bowl. The outcome of the game generally determines "bragging rights" in the state of Alabama until the following contest. The game may also have implications as to which team will represent the SEC Western Division in the SEC Championship Game. On February 22, 1893, at Lakeview Park in Birmingham, Auburn was victorious in the first ever Iron Bowl, 32–22. The series was suspended after the 1907 contest, due to violence and financial complications. In 1944, Auburn suggested to reopen the series, though the Board of Trustees at Alabama rejected. The series was resumed in 1948, with Alabama crushing the Tigers 55–0, which is still the largest margin of victory in the series. In the following contest, Auburn shocked Alabama with a 14–13 victory, which is credited with helping revive the series. For many years, the contest was held at Legion Field in Birmingham, before the teams began alternating between Bryant-Denny Stadium, in Tuscaloosa, and Jordan–Hare Stadium, in Auburn. Alabama won the recent meeting 52-21 in Tuscaloosa and currently leads the series at 46-36-1. Despite the heated in-state rivalry with Auburn, Bear Bryant was more adamant about defeating his rivals to the north, the Tennessee Volunteers. The series is named the Third Saturday in October, the traditional calendar date on which the game was played. Despite the name, the game has only been played on the third Saturday five times between 1995–2007. The first game between the two sides was played in 1901 in Birmingham, ending in a 6–6 tie. From 1902 to 1913, Alabama dominated the series, only losing once, and never allowing a touchdown by the Volunteers. Beginning in 1928, the rivalry was first played on its traditional date and began to be a challenge for the Crimson Tide as Robert Neyland began challenging Alabama for their perennial spot on top of the conference standings. In the 1950s, Jim Goostree, the head trainer for Alabama, began another tradition as he began handing out cigars following a victory over the Volunteers. Between 1971–1981, Alabama held an eleven-game winning streak over the Volunteers and, between 1986–1994, a nine-game unbeaten streak. However, following Alabama's streak, Tennessee responded with a seven-game winning streak from 1995–2001. Alabama has won the last 12 meetings from 2007–2018, a new record. Alabama won the most recent meeting 58-21 in Knoxville, and leads the series 56-38–7. A rivalry within the SEC Western Division occurs yearly between Alabama and the LSU Tigers. Starting in 1895, the Tigers were victorious 12–6 in the first meeting. The teams did not regularly meet until the mid-1960s during Alabama's dominance of the SEC. Between 1971–1981, the Crimson Tide won 11 consecutive times. In the 1969 game, LSU defeated Alabama 20–15 in Baton Rouge. Alabama did not lose again in Baton Rouge until 2000. In 2007, the meeting was more heated following Alabama's hiring of head coach Nick Saban, who previously coached at LSU. With the hiring, many media outlets dubbed the 2007 meeting as the "Saban Bowl". The Crimson Tide lost the first "Saban Bowl" in 2007, won the 2008 and 2009 meetings only to lose in Baton Rouge in 2010. In 2011, the teams played as the consensus No. 1 and No. 2 ranked teams in the polls with LSU winning 9–6 in overtime. They played each other again for the BCS National Championship with Alabama winning 21–0 to secure its 14th National Championship. Alabama won the most recent meeting 29-0 in Baton Rouge and leads the head-to-head series 53-25–5. In recent years, Alabama has developed what some consider to be a rivalry with the Clemson Tigers. In the build-up to the 2018 Sugar Bowl, players and coaches from both teams referred to the series as a "respectful" rivalry. There are numerous connections between the two programs. Clemson's top three winningest head coaches, Frank Howard, Dabo Swinney, and Danny Ford, all played at Alabama, as did Clemson coaches Hootie Ingram and Charley Pell. The teams first played each other in 1900. The series escalated into a rivalry when the teams met in the College Football Playoff in the 2015, 2016, 2017, and 2018 seasons. Clemson won the most recent meeting 44-16, and Alabama leads the series 14-5. Alabama's most played rival is Mississippi State. The rivalry has been called the "Battle for Highway 82", with the schools separated by only 90 miles. Alabama has dominated the series winning 83 of the 103 meetings. Alabama won the most recent meeting 24-0 in Tuscaloosa, and leads the series 83-17-3. Alabama also maintains a rivalry with the Ole Miss Rebels. Alabama has won 54 of the 66 meetings. Alabama won the most recent meeting 62-7 in Oxford, and leads the series 54-10-2. The Georgia Tech Yellow Jackets were at one time considered Alabama's arch rival. During the suspension of the Iron Bowl between 1907 and 1948, Georgia Tech (then a member of the SEC) emerged as the most intense game on Alabama's schedule. The teams played many significant games, especially in the late 1950s and early 1960s. A heated feud developed between Bear Bryant and Georgia Tech head coach Bobby Dodd following a controversial hit in the 1961 game, a 10–0 Alabama victory. Dodd cited this feud as the primary impetus for Georgia Tech leaving the SEC three years later. The two teams have met 52 times, making Georgia Tech Alabama's most played among current non-conference opponents. Alabama leads the series 28–21–3; Georgia Tech won the last meeting in 1984. Alabama's fight song, "Yea Alabama", mentions Georgia Tech with the line "Send those Yellow Jackets to a watery grave." There have been many historic games between Alabama and Penn State. The two teams met five times during the tenure of Bear Bryant, including in the 1979 Sugar Bowl, which determined the national championship for the 1978 season. The games usually have national implications – seven of the fifteen meetings between the two schools have featured both teams ranked in the Top 10 – and eight of the meetings have been decided by a touchdown or less. The most recent game was in 2011, with Alabama winning 27–11. It was the final loss for long-time Penn State head coach Joe Paterno. Alabama leads the series 10–5. This is a partial list of the ten most recent bowl games Alabama competed in. For the full Alabama bowl game history, see List of Alabama Crimson Tide bowl games. Eight former Alabama football players have been inducted into the Pro Football Hall of Fame, the fourth most among all colleges. During the football season, the Crimson Tide Sports Network (CTSN) broadcasts multiple shows on gameday for most sports. The network includes more than sixty radio stations across the country. Radio stations WFFN-FM, WTSK-AM as a backup, broadcast all home games in the Tuscaloosa area. Football radio broadcasts begin three hours prior to the game's designated kickoff time with Chris Stewart and Tyler Watts in Around the SEC. The radio broadcast then moves to the Crimson Tide Tailgate Party hosted by Tom Roberts. Immediately following the end of the game, the Fifth Quarter Show begins as host Eli Gold talks to coaches and players and gives game statistics. For the 2008 season, former Alabama players and personalities were brought on to provide guest commentary for each broadcast. Stewart and Watts also provide play-by-play and color commentary respectively for CTSN pay-per-view television broadcasts. Alabama plays Tennessee as a permanent non-division opponent annually and rotates around the East division among the other six schools. The 2019 game against Duke will be part of the Chick-fil-A Kickoff Game held at Mercedes-Benz Stadium in Atlanta. The 2020 game against USC will be part of the Advocare Classic held at AT&T Stadium in Arlington, Texas. The 2021 game against Miami will be part of the Chick-fil-A Kickoff Game held at Mercedes-Benz Stadium in Atlanta. ^ In 1995, the NCAA forfeited Alabama 8 regular season victories and 1 tie from the 1993 season. ^ a b c "Bryant-Denny Stadium". University of Alabama Athletics. Archived from the original on August 28, 2010. Retrieved August 19, 2010. ^ a b c d "National Championships". University of Alabama Athletics. Archived from the original on October 22, 2008. Retrieved July 14, 2012. ^ "Alabama Crimson Tide Logo Sheet" (PDF). June 28, 2018. Retrieved August 29, 2018. ^ "NCAA Sports Sponsorship". NCAA. Archived from the original on February 10, 2007. Retrieved October 2, 2008. ^ a b c d e f g h i j k l m n "Alabama 2003 Media Guide: National Team Champions" (PDF). University of Alabama Athletics. 2003. Archived from the original (PDF) on July 14, 2012. Retrieved October 2, 2008. ^ a b c d e f "Past Division I-A Football National Champions". NCAA. Archived from the original on November 24, 2009. Retrieved December 29, 2009. ^ "Recognized National Championships by Year". NCAA Official Records. Retrieved January 16, 2017. ^ a b c Armstrong, Kevin (December 12, 2009). "Mark Ingram Wins Heisman Trophy in Close Race". New York Times. Archived from the original on November 14, 2013. Retrieved December 13, 2009. ^ The University of Alabama (August 15, 2012). "2012 Football Record Book" (PDF). rolltide.com. rolltide.com. Archived from the original (PDF) on July 17, 2013. Retrieved October 30, 2012. ^ "2013 Week 12 College Football Power Rankings". ESPN.com. ESPN. November 18, 2013. Archived from the original on November 23, 2009. Retrieved November 18, 2013. ^ "Official 2011 NCAA Football Records Book: Football Bowl Subdivision Records" (PDF). National Collegiate Athletic Association. 2011. p. 128. Archived (PDF) from the original on July 15, 2012. Retrieved July 14, 2012. ^ "Total Appearances in the Final AP Poll". Collegepollarchive.com. Archived from the original on July 14, 2012. Retrieved February 1, 2013. ^ "The Greatest Program of all Time Is ..." Scout with FoxSports.com. August 19, 2012. Archived from the original on September 20, 2011. Retrieved August 22, 2012. ^ "Wallace Wade". College Football Hall of Fame. Football Foundation. Retrieved January 11, 2010. ^ "Frank Thomas". College Football Hall of Fame. Football Foundation. Retrieved January 9, 2010. ^ "Paul Bryant". College Football Hall of Fame. Football Foundation. Retrieved January 9, 2010. ^ Pasquarelli, Len (January 4, 2007). "After repeated denials, Saban takes Bama job". ESPN. Associated Press. Archived from the original on July 15, 2012. Retrieved October 6, 2008. ^ "Football Bowl Subdivision Records pp. 76–78" (PDF). NCAA. Retrieved March 15, 2010. ^ Solomon, John (January 6, 2010) "Got 12? Here's how Alabama bumped up its claim to a dozen national titles". The Birmingham News. ^ "Is Alabama college football's new dynasty?". CNN, Turner Broadcasting Company. Retrieved July 19, 2013. ^ "College Football's Top 25 Greatest Dynasties of the AP Era". FoxSports.com. Retrieved July 19, 2013. ^ a b c d e f g h i j k l "Bowl History" (PDF). University of Alabama Athletics. Archived from the original (PDF) on May 23, 2011. Retrieved October 26, 2008. ^ "UA to honor its oldest living football player". Tuscaloosa News. September 5, 2008. Retrieved October 8, 2008. ^ "All–Time Football Standings 1940–1949". SEC Sports. Archived from the original on July 2, 2016. ^ "1941 Final Football Polls – College Poll Archive – Historical College Football and Basketball Polls and Rankings". collegepollarchive.com. ^ a b "Sports Illustrated". September 11, 1967. Retrieved December 17, 2015. ^ a b Staff Reporters (January 4, 1942). "Tiders to Return Home with Bowl Bacon Today". The Tuscaloosa News. p. 10. Retrieved July 27, 2011. ^ "1973 Final AP Football Poll – AP Poll Archive – Historical College Football and Basketball Polls and Rankings". December 2, 2009. Archived from the original on December 2, 2009. ^ a b "2010 USC Football Media Guide". University of Southern California Sports Department. Retrieved November 22, 2013. ^ Jones, David (December 8, 2009). "Alabama rolls to 32–13 defeat of No. 1 Florida in SEC title game". USA Today. Retrieved January 17, 2010. ^ Whiteside, Kelly (January 7, 2010). "Alabama sidesteps Texas' charge to emerge with BCS title". USA Today. Retrieved January 7, 2010. ^ "LSU kicks winning field goal in OT for defensive-minded win over Alabama". ESPN.com. Associated Press. November 5, 2011. Retrieved July 4, 2014. ^ a b "LSU, Alabama to play for title". ESPN.com. ESPN.com news services. December 4, 2011. Retrieved July 4, 2014. ^ "Alabama stomps Auburn behind Trent Richardson's 203 yards". ESPN.com. Associated Press. November 26, 2011. Retrieved July 4, 2014. ^ a b c "Alabama's D embarrasses LSU as five FGs, late TD seal national title". ESPN.com. Associated Press. January 9, 2012. Retrieved July 4, 2014. ^ "2011 NCAA Football Rankings – Postseason". ESPN.com. Retrieved July 4, 2014. ^ "Johnny Manziel, Texas A&M pull upset as No. 1 Alabama's rally falls short". ESPN.com. Associated Press. November 10, 2012. Retrieved July 4, 2014. ^ "Alabama holds off Georgia, reaches BCS Championship Game". ESPN.com. Associated Press. December 1, 2012. Retrieved July 4, 2014. ^ "Irish-Bama 1–2; N. Illinois busts BCS". ESPN.com. ESPN.com news services. December 2, 2012. Retrieved July 4, 2014. ^ a b "Alabama routs Notre Dame, wins 3rd BCS title in past 4 years". ESPN.com. ESPN.com news services. January 7, 2013. Retrieved July 4, 2014. ^ "Awards compiled NCAA 2008 Record Book Division 1 Football". NCAA. DocStoc. Archived from the original on July 2, 2016. Retrieved December 17, 2009. ^ "Awards and the NFL" (PDF). University of Alabama Athletics. Archived from the original (PDF) on March 20, 2009. Retrieved October 8, 2008. ^ 2009 Alabama Football Media Guide[permanent dead link], p. 156. University of Alabama. ^ "Alabama in the College Football Hall of Fame" (PDF). University of Alabama Athletics. Archived from the original (PDF) on August 20, 2008. Retrieved October 11, 2008. ^ "Hall of Fame: Select group by school". College Football Hall of Fame. Football Foundation. Retrieved October 11, 2008. ^ "Ingram wins Alabama's 1st Heisman". ESPN. Associated Press. December 13, 2009. Retrieved January 12, 2012. ^ "1993 – 59TH Award". Heisman Memorial Trophy. Heisman.com. Archived from the original on July 2, 2016. Retrieved December 13, 2009. ^ Gribble, Andrew (December 14, 2013). "Full breakdown of Heisman trophy voting: Behind Jameis Winston, a tight pack led by AJ McCarron". AL.com. Retrieved December 14, 2013. ^ "Alabama's Henry runs off with Heisman victory". ^ "The 10 greatest rivalries". ESPN. January 3, 2007. Archived from the original on September 24, 2008. Retrieved October 8, 2008. ^ Rappoport, Ken; Barry Wilner (2007). "The Iron Bowl: Auburn-Alabama". Football Feuds: The Greatest College Football Rivalries. Globe Pequot. p. 77. ISBN 1-59921-014-2. ^ "The University of Alabama Football Facts". 2000. Archived from the original on November 19, 2008. Retrieved October 8, 2008. ^ "This is Alabama Football: Iron Bowl" (PDF). University of Alabama Athletics. p. 157. Archived from the original (PDF) on May 4, 2017. Retrieved October 8, 2008. ^ a b c d "The Record Book" (PDF). University of Alabama Athletics. Archived from the original (PDF) on March 20, 2009. Retrieved October 2, 2008. ^ Browning, Al (2001). Third Saturday in October: Tennessee Vs. Alabama: the Game-by-game Story of the South's Most Intense Football Rivalry. Cumberland House. ISBN 1-58182-217-0. ^ Dunnavant, Keith (2006). "The Missing Ring". The Missing Ring: How Bear Bryant and the 1966 Alabama Crimson Tide Were Denied College Football's Most Elusive Prize. Macmillan. p. 170. ISBN 0-312-33683-7. ^ Carlton, Chuck (November 2, 2007). "LSU, Alabama to meet in first Saban Bowl". The Dallas Morning News. Archived from the original on December 5, 2008. Retrieved October 8, 2008. ^ "Bayou, LSU fans brace for Nick Saban Bowl". New York Daily News. November 1, 2007. Retrieved October 8, 2008. ^ "It's Saban Bowl for riled LSU fans". The Seattle Times. November 1, 2007. Archived from the original on December 5, 2008. Retrieved October 8, 2008. ^ Hall of Fame. "Inductees by College". PFHOF. Retrieved November 9, 2011. ^ "Radio/TV Information". University of Alabama Athletics. Archived from the original on September 30, 2008. Retrieved October 8, 2008. ^ a b c "CTSN Game Broadcasts". University of Alabama Athletics. Archived from the original on September 14, 2008. Retrieved October 8, 2008. ^ "CTSN Ready for 2008 Football Season". University of Alabama Athletics. Retrieved October 8, 2008. ^ "The Crew". University of Alabama Athletics. Archived from the original on October 3, 2008. Retrieved October 17, 2008. ^ "Crimson Tide Radio and Television Information, Football". University of Alabama Athletics. Archived from the original on April 8, 2008. Retrieved October 15, 2013. ^ Williamson, Bill (July 11, 2008). "Ex-Raiders star Stabler leaves radio gig". ESPN. Archived from the original on October 9, 2008. Retrieved October 8, 2008. 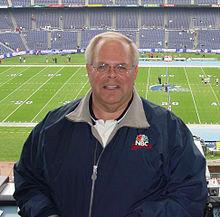 ^ "Stabler leaves UA radio job". The Huntsville Times. July 12, 2008. Archived from the original on June 9, 2011. Retrieved October 8, 2008. ^ "Alabama Crimson Tide Football Schedules and Future Schedules". fbschedules.com. Retrieved December 18, 2016. ^ Adelson, Andrea (November 21, 2016). "Alabama to face Duke in 2019 Chick-fil-A Kickoff Game". ESPN.com. Retrieved December 18, 2016. ^ "Alabama-USC to kick off 2020 season in Texas". ESPN.com. Retrieved June 23, 2018. ^ Richards, George (September 5, 2017). "Miami Hurricanes to renew football rivalry with Nick Saban and Alabama". Miami Herald. Retrieved June 23, 2018. ^ "Alabama Put on Probation College football: NCAA sanctions program for three years. The team is banned from postseason play next season". Los Angeles Times. August 3, 1995. Barnhart, Tony; Keith Jackson (2000). Southern Fried Football: The History, Passion, and Glory of the Great Southern Game. Triumph Books. ISBN 1-60078-093-8. Davis, Terry (1999). Roll Tide: The Alabama Crimson Tide Story. Creative Education. ISBN 0-88682-975-5. Forney, John (1993). Talk of the Tide: an oral history of Alabama football since 1920. Crane Hill Publishers. ISBN 1-881548-03-1. Gold, Eli (2005). Crimson Nation. Thomas Nelson Incorporated. ISBN 1-4016-0190-1. Groom, Winston (2000). The Crimson Tide – An Illustrated History. The University of Alabama Press. ISBN 0-8173-1051-7. Langford, George (1974). The Crimson Tide: Alabama Football. H. Regnery Co. ISBN 0-8092-8363-8. Sharpe, Wilton (2007). Crimson Tide Madness: Great Eras in Alabama Football. Cumberland House Publishing. ISBN 1-58182-580-3. Townsend, Steve (2003). Tales from 1978–79 Alabama Football: A Time of Champions. Sports Publishing LLC. ISBN 1-58261-425-3. Walsh, Christopher J. (2005). Crimson Storm Surge: Alabama Football Then and Now. Taylor Trade Publishing. ISBN 1-58979-279-3. Wells, Lawrence (2000). Football Powers of the South. Sports Yearbook Company. ISBN 0-916242-27-7. Athlon Sports; Mike Shula (2006). Alabama Football: The Greatest Games, Players, Coaches, and Teams in the Glorious Tradition of Crimson Tide Football. Triumph Books. ISBN 1-57243-880-0. The Tuscaloosa News; Mike Bynum, Associated Press (2003). Greatest Moments in Alabama Crimson Tide Football History. Distributors. ISBN 1-928846-65-3. Wikimedia Commons has media related to Alabama Crimson Tide football.